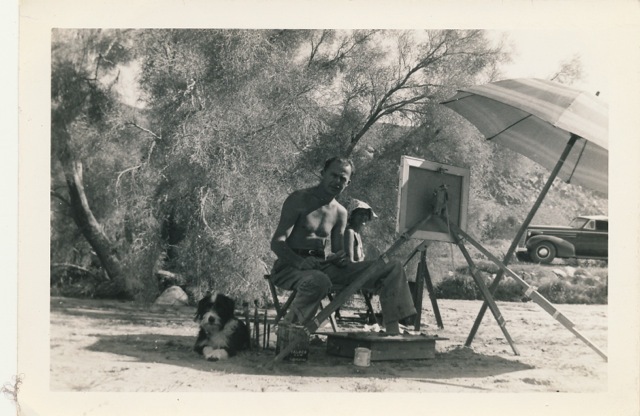 Up on Miracle Hill in Desert Hot Springs, the pueblo-builder and snake-tender Cabot Yerxa took painting lessons from his neighbor, Burt Procter, while Procter’s young daughter Ginny played on a packed dirt floor, sprinkled down with water to keep it cool. Procter had purchased land from Cabot and planned to build a cabin next door to the Pueblo, now a tourist attraction. He would be the first settler in Cabot’s dreamed-of arts colony. 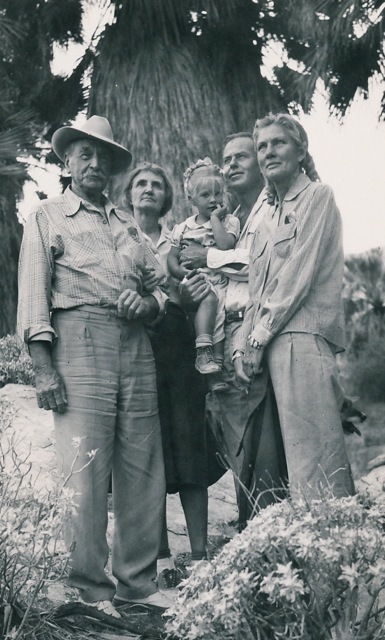 While the colony never materialized, Ginny and her parents often drove out from Corona del Mar in the early 1950s to camp on their land and visit the Cabots. One time they even went out at night with Cabot and his wife Portia to track UFOs. 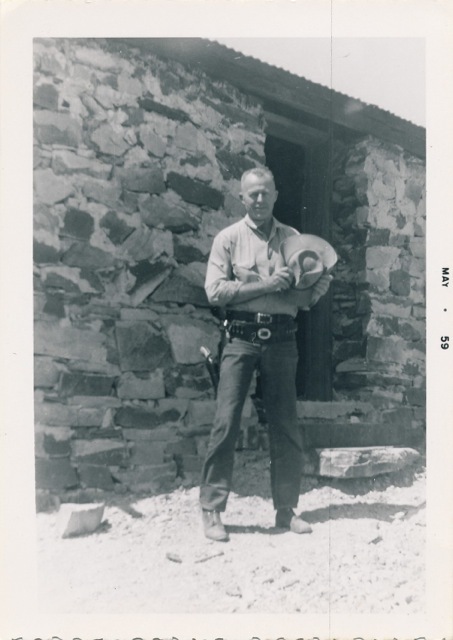 Though she was too young to know it at the time, Ginny was witnessing one of the most poetic partnerships of the Smoketree School: The pueblo builder and the cowboy modernist. While Cabot is better known as an all-around desert character he also studied art in Paris and was a committed painter of Indians, Eskimos and palm trees. He and Procter forged a friendship during many hours of walking in the desert, hunting for dinosaur bones and talking about art. We’ll explore Cabot’s paintings in a forthcoming article. Here the focus is on Procter, a name that haunts the margins of desert art. He has his own chapter in the 1960 classic Painters of the Desert, and desert art collectors admire his work. Yet no one I’ve talked to seems to know much about him. He was no showman like John Hilton and no dandy like Jimmy Swinnerton, so he never developed a pop-star fan base. I’d given up on finding out more until a friend introduced me to Procter’s daughter Ginny Bohannan, a ceramic and textile artist living on Orcas Island in Washington. Now thanks to Ginny we have the priceless photos you see here as well as more of her father’s story. In the world of California and desert artists, Procter’s paintings stand out. 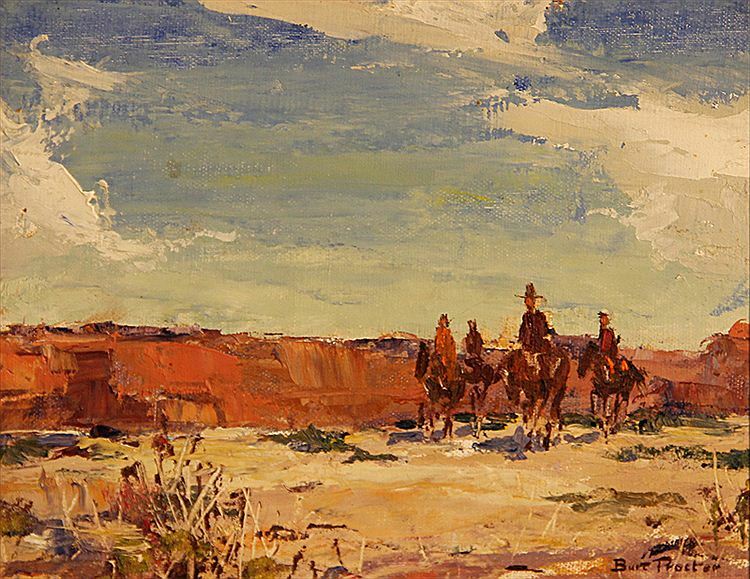 The bold strokes are loose and modern while the subject matter (cowboys and buttes) is squarely traditional. 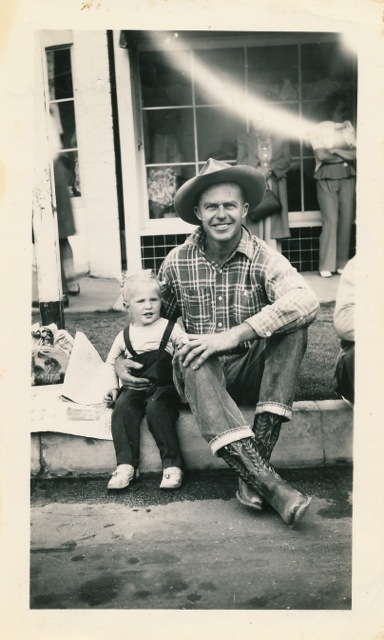 “My father was very much a cowboy at heart,” Ginny says. Cowboy or Western art has often been disparaged but it was once a major part of the desert scene–and it remains popular in places like Jackson Hole, Santa Fe and Scottsdale. For those still on the fence about the genre, the modern-leaning Procter is a good place to start. Born in 1901 in Gloucester, Massachusetts, Procter had an innate connection to horses. He started drawing stick ponies in the margins of Shakespeare by age four. As a young man he studied mining engineering at Stanford University and went to work as a mining engineer at the Grand Canyon. Later he worked in advertising in New York, studying with “golden age” illustrators Harvey Dunn and Pruett Carter. Migrating to LA in the 1930s, Procter studied at the Chouinard and Otis Art Institutes and then entered a five-year period of seclusion, working out his painterly destiny all alone. When he emerged, he went on to create one of the most unique styles in Western art. 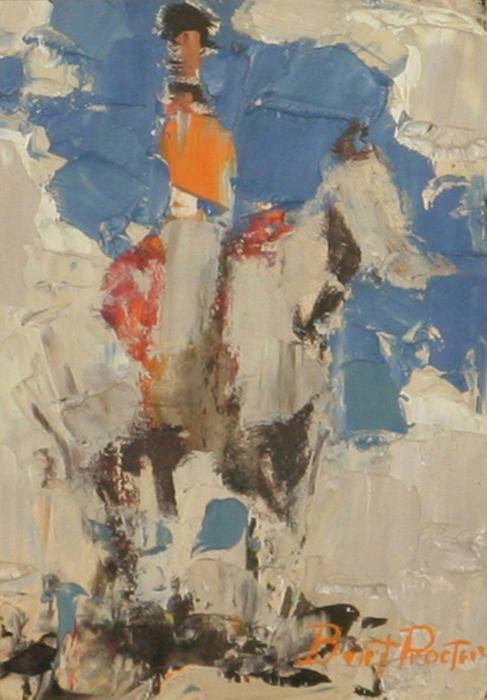 For clues to this later style (he specialized in coastal scenes and Navajo Indians along with the Palm Springs desert), gallery owner Robert Nelson says you have to look to Nicolai Fechin, also once a Palm Springs resident. A fan and collector of the cowboy modernist, Nelson purchased many of Procter’s paintings as well as his studio set-up after the artist’s death. 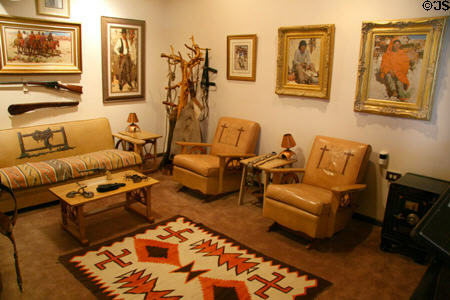 The reassembled studio is on display at Nelson’s Museum of the West in Cheyenne, Wyoming. Burt Procter’s former studio at Nelson Museum of the West in Cheyenne. Photo by Jim Steinhart of www.TravelPhotoBase.com. 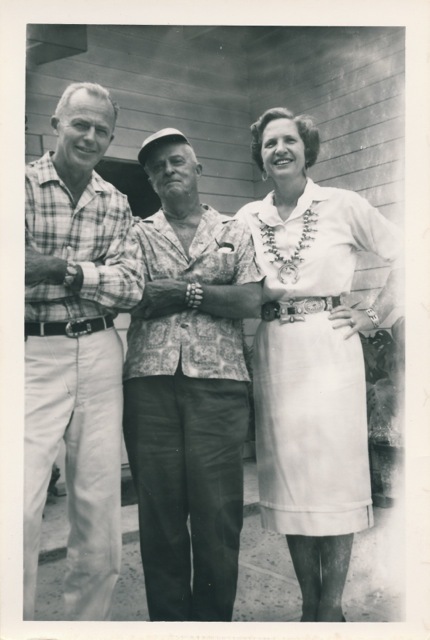 Burt and Katherine Procter were married in 1936 and for a few years rented a small stone house in Araby from Christina Lillian. A patron of desert artists, Lillian remains a mysterious figure in local art history. She also owned the retreat in Cathedral City, Svenska, where Sam Hyde Harris stayed and painted. The Araby rock house where Procter lived. Procter and his dog Patches under a smoke tree. The family’s main home was in Corona del Mar. Ginny grew up riding horses with her father along the three-mile stretch of beach at Crystal Cove. She started visiting Cabot’s when she was still in grade school in the 1950s. Cabot had begun work on the pueblo–with its 65 doors and 150 windows–in 1941. Burt Procter on a camping trip. The truck is Cabot’s. 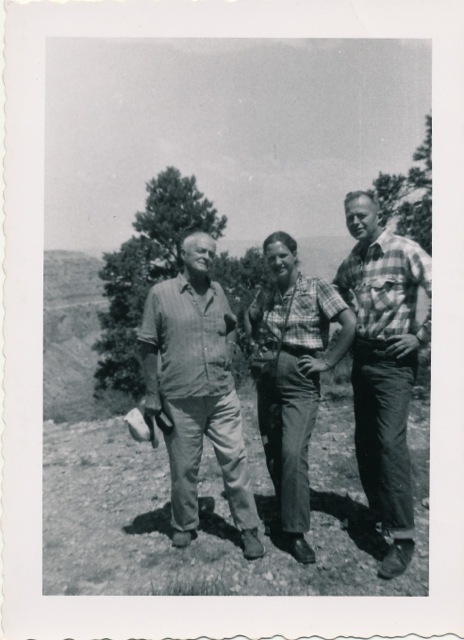 Cabot Yerxa, Katherine and Burt Procter at the Grand Canyon. Back at Miracle Hill and her childhood perch on the packed dirt floor, Ginny had a boxseat view of the greats of the Smoketree School. “Brownell McGrew used to sit on the floor and play jacks with me,” Ginny says. Nicolai Fechin was a family friend who sent Christmas cards every year. Although Ginny doesn’t recall meeting him, another frequent guest at Cabot’s was the early Palm Springs artist Carl Eytel. Cabot first came to the desert in 1913 and met Carl Eytel in 1914. Ginny might have overlooked Eytel because he was small and quiet. Yet this melancholy man was the model for every nomadic nature boy (or girl) artist who came later. Burt Procter holding Ginny. Right, arts patron Christina Lillian. ***Correction. Peggy Pourtemour of Cabot’s museum pointed out that Carl Eytel died in 1925. While he visited Cabot he likely did not meet Procter. The writer had artistic icon confusion. In 1968 the Procters settled full-time at 1037 Via Altamira in Palm Springs. Near the end of his life Procter began teaching Bill Bender his technique so he could pass it on to others. “We were the best of friends and judged many shows together,” says Bender, who now lives in Victorville. Procter died shortly after the lessons began. Bender, an accomplished cowboy painter in his own right, never did adopt the Procter style, a style that remains Procter’s own. Burt Procter at the stone house, forever a cowboy. Burt Procter and Ginny at a Palm Springs parade. Great article and historical pictures. Thank you Ann for introducing us to Burt Procter. Fascinating story and full of great photos and text. Great work, Ann! Although I was very familiar with the work I knew very little about the artist -until now. 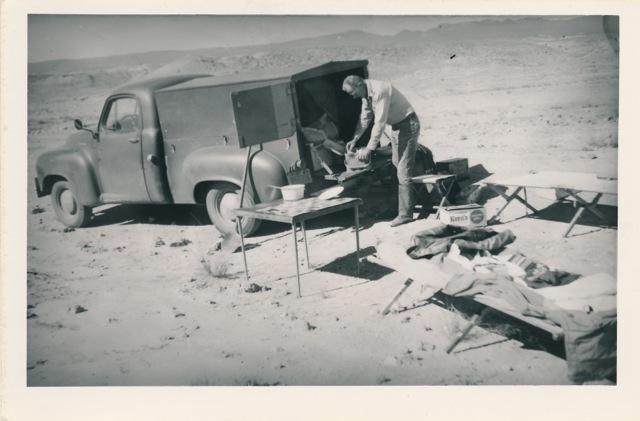 Another great post on an authentic desert painter. I went back to the wonderful Ed Ainsworth book “Painters of the Desert” and re-read the chapter on Burt Procter. Thank you for filling in some more details on his life and work. Is there some gallery that exhibits art from this era that you would recommend? Great work Ann. You are as much a treasure as the folks you write about. Thanks to you and the “interwebs” these pieces are a giant step in detailing and immortalizing this wonderful history. I can’t wait to get up to Araby and see if I can’t find the spots where the stone house pictures are taken! Thank you Bruce. Unfortunately there is no gallery in the Coachella Valley that spotlights the early painters. Outside of the Valley, the Bodega Bay Heritage Gallery in Northern California and Gary Fillmore’s Blue Coyote Gallery in Cave Creek, Arizona are your best bets to find information and paintings. If anyone wants to start a vintage desert art gallery here, I’ll help. Many thanks Terry. You can see the stone houses by looking across Millicent’s favorite smoke tree wash. There are legends that midgets once lived in the teeny houses! I’m glad you appreciate the history–you and your painter friends are writing the story now. Thank you again, Ann, for a great article and another branch in the smoke tree. How wonderful. In all my researching on my Coachella heritage paintings I always find you have already been there. What remarkable research. I am currently researching Yerxa’s early life (1913-1914)for a painting of him I am currently working on and your research provides new insights on this remarkable man. Loved your story on the love letters also. Love the continued education that you brings us Ann. As a painter it inspires me even more to paint the coachella valley. Ann, what a treasure of a story! and I second the writer who claims you as treasure too. It’s amazing how you ferret out the near-forgotten art saints of vintage desert, or how they and their progeny find you. Wonderful stories and priceless photos. I lived in one of the “Indian houses” of Araby in 1979-80 and moved to the high desert when scorpions big as lobsters became regular visitors. Lastly… if someone will donate the space, I will run the gallery of vintage desert art. In 1959 I started working at the Laguna Beach Festival of Arts. Burt Procter was always an exhibitor there, but nobody ever saw him. He was an immanence gris whose work was always unique and compelling, always in demand. He was popularly known for the many illustrations he did for “The Saturday Evening Post”, which activity diminished him somewhat in the eyes of fools. I wish, in the light of this article, that I had made an effort to meet him. He was ancient and unapproachable in my imagination; another example of youthful folly, should that be needed. Over many years I have come to regard the essence of good painting to be abstraction balanced with content, and at this Burt Procter was stellar. The cowboy content was beside the point of excellent painting. Thanks for the thoughtful note on Procter. I like your goal for good painting: “abstraction balanced with content.” Please tell me if you discovered other lesser-known desert painters in your years at the Laguna Beach Festival of Arts. Do you think it possible, the unidentified man (left) in the photo of Burt Procter (holding Ginny) and Christina Lillian is Hanson Duvall Puthuff? Also, I believe I have found more info on Christina Lillian. Born Emma Christina Lillian 1/21/1888 Lindsburg, McPherson County, Kansas. Died 2/1/1976, Thousand Oaks, Ca. Buried @Elmwood Cemetary, Lindsburg, Kansas. Parents: John Lillian (1837-1915) and Ann Nelson Lillian (1851-1925). Siblings Carl William Lillian (1875-1925) and Edith Bernadine Lillian Swanson (1893-1961). Her connection w/so many desert artists, art galleries, PS Artists Guild, homes in Araby and Cathedral City is remarkably intriguing. I found one photo of Hanson Puthuff online and he does resemble the man in the photo. An intriguing guess and I’m curious how you came up with it. I’d love to find any relatives of Christina Lillian. Maybe your info will point in that direction. 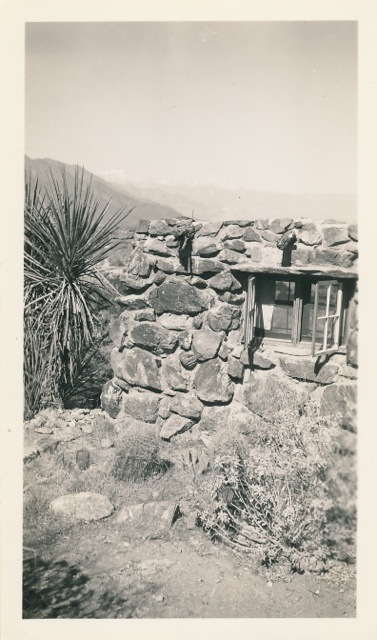 Some Agnes Pelton letters I recently read (to Jane Levington Comfort) reveal that Christina Lillian was also Agnes Pelton’s neighbor in the Cathedral City cove, and gave her rides to the mountains. Lillian may have been our local Mabel Dodge Luhan–an influential arts patroness. Ann Japenga — Christina Lillian was my great-aunt. I have a few of her memoirs and photographs, which I will be happy to share. We knew her as “Aunt Emma”. I met Mr. and Mrs. Burt Proctor many years ago when we were exhibiting our art works together in the museum of the Wichita Art Association. The Proctors told me that they were married in Christina’s home. Christina was a friend of Mabel Dodge Luhan, Georgia O’Keefe, D.H. Lawrence and Freida Lawrence, about whom she enjoyed reminiscing. In Hollywood, she was a friend of Greta Garbo (both spoke Swedish) and designed some gowns for her, including gowns in some of Garbo’s films — I don’t have the titles of those films. She mentioned Henry Miller as a friend also. She had a 1927 Studebaker that she drove throughout the desert, transporting Apaches in Arizona with their freshly-killed game strapped to the front fenders. She studied painting with Hans Hoffman. Her notes, taken during his lectures, are in the archives at Berkeley and were used in a documentary film on Hoffman. Denise Cross, your information is basically correct, but her mother’s name was “Anna Nelson Lillian”. Christina had several other siblings, including my grandmother, who were not included in your list. The family’s surname was originally “Lilja”, but was changed to Lillian for ease of pronunciation. Thanks for the wonderful piece about Burt. Katherine was a distant relative of my father’s, but I always referred to Burt and Katherine as my aunt and uncle. I visited them at their homes in Corona del Mar and Palm Springs several times in my search of the meaning of life while I was in college. They were simply the best. It’s interesting that Christina Lillian was born in the Swedish community of Lindsborg, Kansas. It was also the home of my favorite impressionist Birger Sandzen. It’s a very small town and was undoubtedly art focused, including music.